Seven public organizations - namely the Ministry of Foreign Affairs; the Ministry of Information, Communication, and Technology; the Ministry of Culture; the Department of International Trade Promotion (DITP); the Tourism Authority of Thailand (TAT); the Bangkok Metropolitan Administration (BMA); and the Thailand Convention and Exhibition Bureau - TCEB (Public Organization) - join forces with giant digital content and entertainment organizers to hold a mega event entitled “Bangkok Entertainment Week,” featuring Bangkok Comic Con 2015 x Anime Festival Asia Thailand 2015, to be run by BEC-Tero TrueVisions Co, Ltd.; Bangkok International Digital Content Festival 2015, to be run by five major associations in the Thai digital contents industry; Thailand Comic Con 2015, to be run by Kantana Group Public Co., Ltd. in collaboration with P.P.W. Interactive Co., Ltd.; and Thailand Toy Expo 2015, to be run by Wisely Tradings Co., Ltd. All the events will be organized during April 27 and May 3, 2015 at venues along the BTS route, including the Centara Grand Hotel at Central World, Central World Shopping Center, Siam Paragon, Bangkok International Trade and Exhibition Center (BITEC) Bangna, Bangkok Art and Culture Centre, and along the BTS SkyWalk. The organizers of these four events aim to transform Bangkok into a city of happiness filled with fun, colorful, and entertaining activities, and to creatively add economic and business value to this metropolis through a parade of activities from across the world. This is considered a big leap toward promoting Bangkok - well prepared in terms of its capacity and all relevant aspects - as a hub of the digital content business in the ASEAN region and encouraging Thai professionals to step into the global stage in both quantitative and qualitative terms, in response to the booming digital content industry. Therefore, the seven public organizations have attached importance to Bangkok Entertainment Week. Not only have they allocated the budget required, but they have also provided other types of support with the collaboration of agencies under the supervision of relevant ministries, such as inviting renowned guest speakers from abroad, organizing seminars and workshops, conducting business matching, carrying out trade negotiations, granting awards to exceptional pieces of work, running activities for children and teenagers as well as interested persons, arranging demonstrations of creative works, holding fairs featuring handicrafts and other forms of art, and publicizing information locally and abroad. Mrs. Supawan Teerarat, Vice President, Strategic and Business Development of Thailand Convention and Exhibition Bureau (TCEB), is confident that Bangkok Entertainment Week will underline a positive image of Thailand as a hub of international and mega events in the ASEAN region. “Bangkok Entertainment Week will highlight the position of Thailand as a country with great potential in this regard and be a golden opportunity for leading the organization of a mega entertainment event on the international level. We are ready in terms of strategic location given our status as a gate to the ASEAN region, infrastructures, venues and facilities, as well as the strength of the private sector, and the collaboration of the public sector - all the key success factors required. The event will play an important part in attracting 10% more quality tourists to events, conventions and fairs in Thailand, from the existing rate of 3 - 5%,” Mrs. Supawan concluded. According to the Software Industry Promotion Agency (Public Organization) -SIPA, the animation, game, and e-learning sector of the digital content market in Thailand in 2011 was worth THB16,467 million in total, divided into THB8,806 million for the game sector, THB5,623 million for the animation sector, and THB2,038 million for the e-learning sector. 71% of the total market value was attributable to imports with the remaining 29% accounted for by the works of Thai entrepreneurs. This could be further divided into 23% produced for local markets and 6% for international markets. The total value of animation products and game products of Thai entrepreneurs equaled THB1,100 million and THB387 million, respectively. Console games, all produced for export, constituted the sector with the highest growth rate of 190% and online games enjoyed a growth rate of 150%—both of which a result of the high degree of business accessibility and the low degree of investment for the game industry. 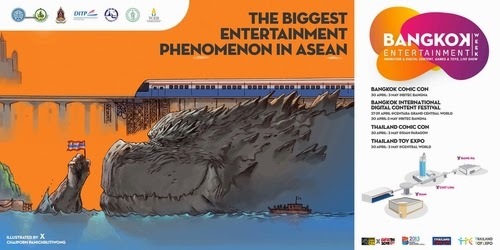 Join the fun to the fullest throughout this 7-day event in ‘Bangkok: City of Smiles’ and share our pride in hosting ASEAN’s largest international digital content and entertainment event at Bangkok Entertainment Week during this coming April 27-May 3. Follow us for a wide variety of fun activities at www.bkkentweek.com.